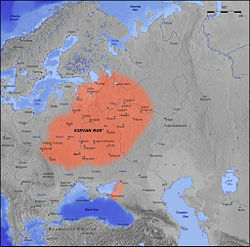 Kievan Rus′ was the early, mostly East Slavic state dominated by the city of Kiev from about 880 C.E. to the middle of the twelfth century. People speaking East Slavic dialects were known from the ninth century as Rus (also referred to as ancient Russians or Ruthenians). Later, they diverged into three major nations—modern Belarusians, Russians, and Ukrainians, and also into several minor ethnic groups, including Carpatho-Ruthenians. From the historiographical point of view, Kievan Rus' is considered a predecessor state of three modern East Slavic nations: Belarus, Russia and Ukraine. The reigns of Vladimir the Great (980-1015) and his son Yaroslav I the Wise (1019-1054) constitute the Golden Age of Kiev, which saw the acceptance of Orthodox Christianity and the creation of the first East Slavic written legal code, the Russkaya Pravda. Kievan Rus' played an important role not only in the development of Russia, but in Europe as well. It was situated on two important trade routes, the Volga route to Scandinavian lands, and the caravan route connecting Europe to the Muslim nations. As a major trade partner Kievan Rus' served as a buffer for the rest of Europe against the invasions of the Golden Horde. Kiev stood at the crossroads between East and West. The civilizations that it spawned would ultimately shape world history. Upon year 6367 (859 C.E. ): Varangians from over the sea had tribute from Chuds, Slavs, Merias, Veses, Krivichs …. Upon year 6370 (862 C.E. ): [They] Drove the Varangians back beyond the sea, refused to pay them tribute, and set out to govern themselves. But there was no law among them, and tribe rose against tribe. Discord thus ensued among them, and they began to war one against the other. They said to themselves, "Let us seek a prince who may rule over us, and judge us according to custom." Thus they went overseas to the Varangians, to the Rus. These particular Varangians were called Rus, just as some are called Swedes, and others Normans and Angles, and still others Goths [Gotlanders], for they were thus named. The Chuds, the Slavs, the Krivichs and the Ves then said to the Rus, "Our land is great and rich, but there is no order in it. Come reign as princes, rule over us." Three brothers, with their kinfolk, volunteered. They took with them all the Rus and came. These Varangians first settled in Ladoga, then moved southward to Novgorod eventually reaching Kiev, finally putting an end to the Khazars' collection of tribute from Kievans. The so-called Kievan Rus was founded by prince Oleg of Kiev (Helgu in Khazarian records) about 880 C.E. During the next 35 years, Oleg and his warriors subdued the various Eastern Slavic and Finnic tribes. In 907 C.E. Oleg led an attack against Constantinople, and in 911 C.E. he signed a commercial treaty with the Byzantine Empire as an equal partner. The new Kievan state prospered because it had an abundant supply of furs, beeswax, and honey for export and because it controlled three main trade routes of Eastern Europe: the Volga trade route from the Baltic Sea to the Orient, the Dnieper trade route (from the Varangians to the Greeks) from the Baltic Sea to the Black Sea, and the trade route from the Khazars to the Germans. Given the postulated pro-Scandinavian bias of the Russian Primary Chronicle, some Slavic historians have debated the role of the Varangians in the establishment of Kievan Rus′. By the reign of Sviatoslav I, Prince of Kiev (r. 945-972) Kievan rulers had adopted Slavic religion and names, but their druzhina still consisted primarily of Scandinavians. Svyatoslav's military conquests were astonishing: he dealt lethal blows to two of his strongest neighbors, Khazaria and the Bulgarian Empire, which collapsed soon after his raids. The region of Kiev dominated the state of Kievan Rus′ for the next two centuries. The grand prince (velikiy kniaz') of Kiev controlled the lands around the city, and his theoretically subordinate relatives ruled in other cities and paid him tribute. The zenith of the state's power came during the reigns of Prince Vladimir (Vladimir the Great, r. 980-1015) and Prince Yaroslav (the Wise; r. 1019-1054). Both rulers continued the steady expansion of Kievan Rus′ that had begun under Oleg. 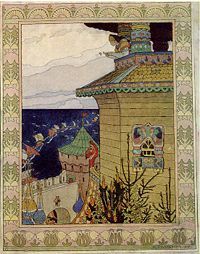 Novgorod merchants sailing overseas, by Ivan Bilibin. Vladimir rose to power in Kiev after the death of his father Sviatoslav I in 972 and after defeating his half-brother Yaropolk in 980. As Prince of Kiev, Vladimir's most notable achievement was the Christianization of Kievan Rus′, a process that began in 988. The annals of Rus state that when Vladimir had decided to accept a new faith instead of the traditional Slavic religion (paganism), he sent out some of his most valued advisors and warriors as emissaries to different parts of Europe. After visiting the Roman Catholics, the Jews and the Muslims, they finally arrived in Constantinople. There, they were so astounded by the beauty of the cathedral of Hagia Sophia and the liturgical service held there, that they made up their minds there and then about the faith they would like to follow. Upon their arrival home, they convinced Vladimir that the faith of the Greeks was the best choice of all, upon which Vladimir made a journey to Constantinople and arranged a marriage between himself and Princess Anna, the sister of the Byzantine emperor Basil II. Vladimir's choice of Eastern Christianity may also have reflected his close personal ties with Constantinople, which dominated the Black Sea and hence trade on Kiev's most vital commercial route, the Dnieper river. Adherence to the Eastern Orthodox Church had long-range political, cultural, and religious consequences. The church had a liturgy written in Cyrillic and a corpus of translations from the Greek that had been produced for the Slavic peoples. The existence of this literature facilitated the conversion to Christianity of the Eastern Slavs, introducing them to rudimentary Greek philosophy, science, and historiography without the necessity of learning Greek. In contrast, educated people in medieval Western and Central Europe learned Latin. Enjoying independence from the Roman authority and free from tenets of Latin learning, the East Slavs developed their own literature and fine arts, quite distinct from those of other Orthodox countries. Yaroslav, known as "The Wise," also struggled for power with his brothers. Although he first established his rule over Kiev in 1019, he did not have uncontested rule of all of Kievan Rus until 1036. Like Vladimir, Yaroslav was eager to improve relations with the rest of Europe, especially the Byzantine Empire. Yaroslav's granddaughter, Eupraxia, the daughter of his son Vsevolod I, Prince of Kiev, was married to Henry III, Holy Roman Emperor. Yaroslav also arranged marriages for his sister and three daughters to the kings of Poland, France, Hungary, and Norway. Yaroslav promulgated the first East Slavic law code, Russkaya Pravda (Justice of Rus′); built Saint Sophia Cathedral in Kiev and Saint Sophia Cathedral in Novgorod; patronized local clergy and monasticism; and is said to have founded a school system. Yaroslav's sons developed the great Kiev Pechersk Lavra (monastery), which functioned in Kievan Rus′ as an ecclesiastical academy. The interior of the Saint Sophia Cathedral constructed in the eleventh century. The cathedral remains a symbol of the Golden Age of Kiev. In the centuries that followed the state's foundation, Rurik's descendants shared power over Kievan Rus′. Princely succession moved from elder to younger brother and from uncle to nephew, as well as from father to son. Junior members of the dynasty usually began their official careers as rulers of a minor district, progressed to more lucrative principalities, and then competed for the coveted throne of Kiev. In the eleventh century and the twelfth century, the princes and their retinues, which were a mixture of Slavic and Scandinavian elites, dominated the society of Kievan Rus′. Leading soldiers and officials received income and land from the princes in return for their political and military services. Kievan society lacked the class institutions and autonomous towns that were typical of West European feudalism. Nevertheless, urban merchants, artisans, and laborers sometimes exercised political influence through a city assembly, the veche (council), which included all the adult males in the population. In some cases, the veche either made agreements with their rulers or expelled them and invited others to take their place. At the bottom of society was a small stratum of slaves. More important was a class of tribute-paying peasants, who owed labor duty to the princes; the widespread personal serfdomthat became so characteristic of Western Europe did not exist in Kievan Rus′, however. Kievan Rus′ was not able to maintain its position as a powerful and prosperous state, in part because of the amalgamation of disparate lands under the control of a ruling clan. As the members of that clan became more numerous, they identified themselves with regional interests rather than with the larger patrimony. Thus, the princes fought among themselves, frequently forming alliances with outside groups such as the Polovtsians, Poles, and Hungarians. During the years from 1054 to 1224 no fewer than 64 principalities had a more or less ephemeral existence, 293 princes put forward succession claims, and their disputes led to 83 civil wars. The Crusades brought a shift in European trade routes that accelerated the decline of Kievan Rus′. In 1204 the forces of the Fourth Crusade sacked Constantinople, making the Dnieper trade route marginal. As it declined, Kievan Rus′ splintered into many principalities and several large regional centers: Novgorod, Vladimir-Suzdal, Halych, Polotsk, Smolensk, Chernigov (modern Chernihiv), and Pereyaslav. The inhabitants of those regional centers then evolved into three nationalities: Ukrainians in the southeast and southwest, Belarusians in the northwest, and Russians in the north and northeast. In the north, the Republic of Novgorod prospered as part of Kievan Rus' because it controlled trade routes from the Volga River to the Baltic Sea. As Kievan Rus' declined, Novgorod became more independent. A local oligarchy ruled Novgorod; major government decisions were made by a town assembly, which also elected a prince as the city's military leader. 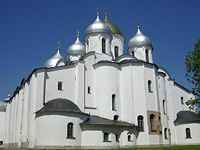 In the twelfth century, Novgorod acquired its own archbishop, a sign of increased importance and political independence. In its political structure and mercantile activities, Novgorod resembled the north European towns of the Hanseatic League, the prosperous alliance that dominated the commercial activity of the Baltic region between the thirteenth century and the seventeenth century, more than the other principalities of Kievan Rus'. In the northeast, Slavs colonized the territory that eventually became Muscovy by bringing into subjection and merging with the Finno-Ugric tribes already occupying the area. The city of Rostov was the oldest center of the northeast, but it was supplanted first by Suzdal′ and then by the city of Vladimir, which become the capital of Vladimir-Suzdal′. There was recorded a large wave of migrations from Kyiv region northward, to escape continuing excursions of the Turkic nomads from the "Wild Steppe." As the southern lands were being depopulated and more boyars, nobles, artisans arrived to the court at Vladimir, the combined principality of Vladimir-Suzdal′ asserted itself as a major power in Kyivan Rus′. In 1169 Prince Andrey Bogolyubskiy of Vladimir-Suzdal′ dealt a severe blow to the waning power of Kyivan Rus′ when his armies sacked the city of Kyiv. Prince Andrey then installed his younger brother, who ruled briefly in Kyiv while Andrey continued to rule his realm from Suzdal′. Thus, political power began to drift away from Kyiv in the second half of the twelfth century. In 1299, in the wake of the Mongol invasion, the metropolitan moved from Kyiv to the city of Vladimir, and Vladimir-Suzdal′ replaced Kyiv as a religious center for the northern regions. To the southwest, the principality of Halych had developed trade relations with its Polish, Hungarian, and Lithuanian neighbors, emerging as the local successor to Kievan Rus′. In the early thirteenth century, Prince Roman Mstislavich united the two previously separate principalities, conquered Kiev, and assumed the title of grand duke of Kievan Rus′. His son, Prince Daniil (Danylo; r. 1238-1264) was the first ruler of Kievan Rus′ to accept a crown from the Roman papacy, apparently doing so without breaking with Constantinople. Early in the fourteenth century, the patriarch of the Eastern Orthodox Church in Constantinople granted the rulers of Halych-Volhynia a metropolitan to compensate for the move of the Kievan metropolitan to Vladimir. Lithuanian rulers also requested and received a metropolitan for Novagrudok shortly afterwards. Early in the fifteenth century, these Metropolia were ruled again from Kiev by the "Metropolitan of Kiev, Halych and all Rus′." However, a long and unsuccessful struggle against the Mongols combined with internal opposition to the prince, and foreign intervention weakened Halych-Volhynia. With the end of the Mstislavich branch of the Rurikids in the mid-fourteenth century, Halych-Volhynia ceased to exist; Poland conquered Halych; Lithuania took Volhynia, including Kiev, conquered by Gediminas in 1321 ending the rule of Rurikids in the city. Lithuanian rulers then assumed the title of the monarchs of Ruthenia. Kievan Rus', although sparsely populated compared to Western Europe was not only the largest contemporary European state in terms of area but also one of the most culturally advanced. "The adoption of Christianity by Vladimir… was followed by commerse with the Eastern Empire. In its wake came Byzantine art and culture. And in the course of the next century what is now Southeastern Russia became more advanced in civilization than any western European State of the period, for Russia came in for a share of Byzantine culture, then vastly superior to the rudeness of Western nations." At the time when only a few European monarchs could spell their name, most children in Kiev, Novgorod and other large cities were literate. It is to the credit of Vladimir and his advisors they built not only churches but schools as well. This compulsory baptism was followed by compulsory education… Schools were thus founded not only in Kiev but also in provincial cities. From the "Life of St. Feodosi" we know that a school existed in Kursk around the year of 1023. By the time of Yaroslav's reign (1019-54), education had struck roots and its benefits were apparent. Around 1030 Iaroslav founded a divinity school in Novgorod for three hundred children of both laymen and clergy to be instructed in "book-learning." As a general measure he bade the parish priests to "teach the people." Kievan Rus' played an important genealogical role in European politics as well. 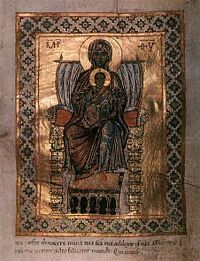 Yaroslav the Wise, whose step-mother belonged to the greatest dynasty to rule Byzantium, married the only legitimate daughter of the king who Christianized Sweden. His daughters became Queens of Hungary, France, and Norway, his sons married the daughters of a Polish king and a Byzantine emperor (not to mention a niece of the Pope), while his granddaughters were a German Empress and (according to one theory) the Queen of Scotland. A grandson married the only daughter of the last Anglo-Saxon king of England. Actually, no other contemporary royal family was so well-connected as the Rurikids. "By means of these marital ties, Kievan Rus’ became well known throughout Europe." Unsurprisingly, Kievan Rus' left a powerful legacy. The leader of the Riurikid Dynasty united a large territory inhabited by East Slavs into an important, albeit unstable, state. After Vladimir accepted Eastern Orthodoxy, Kievan Rus' came together under a church structure and developed a Byzantine-Slavic synthesis in culture, statecraft, and the arts. In the Western periphery, Rus' legacy was carried for two more centuries by the Principality of Halych-Volhynia. Later, as these lands along with the territories of modern central Ukraine and Belarus fell to the Gediminids, the powerful, largely Ruthenized Grand Duchy of Lithuania, drew heavily on Rus' cultural and legal traditions. On the northeastern periphery of Kievan Rus', those traditions were adapted to form the legacy that gradually gravitated towards the Moscow rulers, eventually leading to modern Russian statehood. Thus, modern Russia can trace a lineage to historic Rus' via Vladimir-Suzdal, Muscovy, and the Russian Empire. In the very north, the Novgorod and Pskov Feudal Republics carried on a separate and less autocratic version of Rus' legacy into the sixteenth century until they were absorbed by Muscovite Russia. ↑ The Columbia Encyclopedia, Sixth ed. (2001-2005.) "Kievan Rus"  Columbia University Press. Retrieved December 9, 2007. ↑ Paul Halsall. Online Medieval Sourcebook: Tables on Population in Medieval Europe. , Retrieved December 9, 2007. ↑ Charles Phineas Sherman, "Russia." Roman Law in the Modern World. (Boston: The Boston Book Company, 1917) googlebooks. Retrieved December 9, 2007. ↑ Mikhail Nikolaevich Tikhomirov. Drevnerusskie goroda (Cities of Ancient Rus)  (Moscow: 1956) "Literacy among the citi dwellers"  (in Russian) Retrieved December 9, 2007. ↑ George Vernadsky. "Russian Civilization in the Kievan Period: Education" Kievan Russia. (New Haven: Yale University Press, 1973) Facsimile online   (in English) Retrieved December 9, 2007. ↑ Donald Reid, et al. (eds.) Paris sewers and sewermen: realities and representations, 2nd edition. (Cambridge, Mass: Harvard University Press, 1991. ISBN 0674654633)  (online text in Russian) Retrieved December 9, 2007. ↑ N. Miklashevsky, et al. (eds). Chistaya voda (Clean water)  (Saint Petersburg, Russia: 2000) (in Russian) "Istoriya vodoprovoda v Rossii (History of water-supply in Russia") . Retrieved December 9, 2007. ↑ Mikhail Nikolaevich Tikhomirov. Пособие для изучения Русской Правды  2nd edition. (Moscow: Издание Московского университета, 1953) (in Russian) Retrieved December 9, 2007. ↑ George Vernadsky. "Social organization: Woman" in Kievan Russia. (New Haven: Yale University Press, 1973. ISBN 0300016476)  Online facsimile. googlebooks. Retrieved December 9, 2007. ↑ Mikhail Nikolaevich Tikhomirov. Drevnerusskie goroda (Cities of Ancient Rus) (Moscow: 1956), 36, 39, 43 (in Russian) "The origin of Russian cities." (in Russian) Retrieved December 9, 2007. Rus’ Internet Encyclopedia of Ukraine. Olga Pletneva Ancient Rus:trade and crafts russia-ic.com. This page was last modified on 17 April 2018, at 14:25.